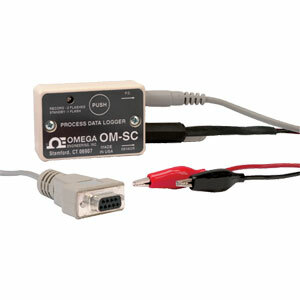 Whether the OM-SC datalogger records for an hour, a week or a year, by using its innovative time extension recording technique, the completed recording is at a sampling interval that is appropriate for the length of the recording session. Initially the datalogger samples every 0.88 seconds. In 2 hours, its memory is full. It then doubles its sampling interval and continues recording. After 4 hours, its memory is full again using a sampling interval of 1.76 seconds. Each time its memory fills up, the OM-SC doubles its sampling interval and repeats the process. Refer to the table above for a list of sampling intervals corresponding to various lengths of recording sessions. 참고: *includes OM-SC datalogger, OM-SC-C-T (temperature input cable), OM-SC-C-I (4 to 20 mA input cable), OM-SC-C-V (DC voltage/contact closure input cable), OM-SC-C-AL (ambient light sensor), and OM-SC-S-I (Windows software and RS-232 cable). Datalogger is supplied with complete operator’s manual.